Silver BritePlus MX cleans & brightens a dirty aluminum trailer to look like new! These two photos show just how well Silver BritePlus MX cleans oxidized aluminum trailers. 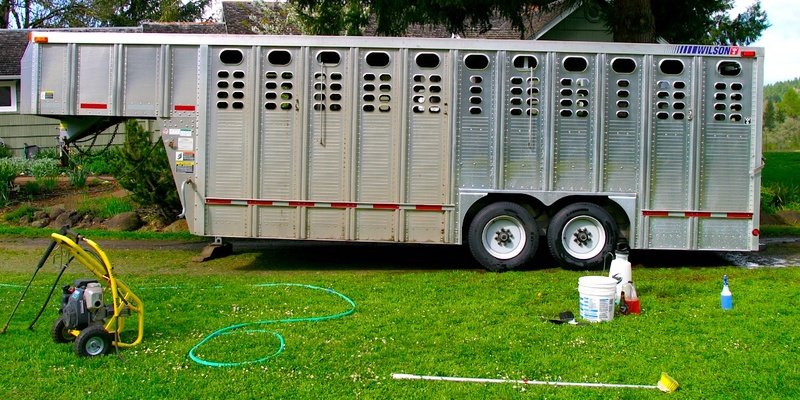 This Wilson aluminum stock trailer is only four years-old, but it gets used hard on an Oregon cattle ranch—and they don’t spend a lot of time cleaning. It’s been pressure washed before, but that’s about it. In these photos, the top ‘before’ picture has been pressure washed from the wheels back and let dry. The ‘after’ photo shows the bright, clean look of the polished aluminum trailer sides after a full cleaning with Silver BritePlus MX. As you can see, Silver BritePlus MX can do what pressure washing and soap scrubbing never could. Silver BritePlus MX removes oxidation and stains that would be impossible to remove with pressure washing or detergents. The result is a clean, bright and shiny finish to the polished aluminum—much like it was when it was new! The best thing about Silver BritePlus MX (and BritePlus MX) is how these aluminum trailer cleaners can not just restore aluminum and stainless steel, but maintain a like-new finish. Without doing damage like a commercial acid wash. It’s best to start using these safe, simple, effective—and economical—aluminum cleaners when your trailer is new! Because now you can get professional results at home!